Needless to say Nativ was the most remarkable year of my life. I think about significant moments in the year like our long sukkot desert tiyul, volunteering in India, or teaching in an Israeli school and Bedouin after school program in Yerucham as all times in my year where I gained a better sense of who I am, what my goals are, and how I intend to execute them to the best of my ability. After leaving the home and cacoon me and my Nativ 37 family built together, I was terrified for the daunting beginning of a new, unwritten chapter of my life: college. When I first arrived to school, college was a terrifying, big place, with a plethora of people and opportunities to make the most of. Truthfully, I had no idea where to start looking or who to even talk to. I felt locked in a maize of 45,000 people. In leu of this struggle, I channeled Nativ’s famous two word mantra: opportunity time. On Nativ free time was never merely “free time”to sit around and twiddle our thumbs. This “empty” time was the time where each Nativer went out into the glorious Jerusalem training for half marathons, exploring new restaurants, attending fascinating lectures, and capturing magnificent photos overlooking the old city. We were all encompassing our passions into this home we built for ourselves, a place that would become so familiar and so uniquely us. Nativ prepared me unbelievably well for that beginning hurdle in college. Faced with a vast amount of extracurricular opportunities and limitless subjects to study, I knew I needed to focus myself on things that truly give me joy, and compliment the best version of me. 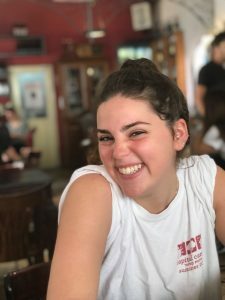 Additionally, I think one of the most invaluable lessons that Nativ taught me in preparation for college is a better ability to see multiple perspectives in discussion and learn from differences in multiple perspectives and collective memories. Through programming and endless discussion we each facilitated in our own “yom Nativs”, days each Nativer planned to educate our peers on a new topic, we each crafted a detailed plan of conversation regarding a certain subject. This allowed us to further immerse ourselves in raw conversation. The growth I have undergone because of Nativ is truly incalculable and my ability to engage with others in college wouldn’t have been where it is without Nativ. Are you a Boger Nativ or the parent of a Nativer? We invite you to submit a post for the Nativ blog about your experiences. Help support Nativ programs, seminars, and activities - donate now. Sponsored by JAFI and "MASA", The Project for Long Term Programs of the Government of Israel and the Jewish Agency of Israel. Copyright © 2019, Nativ College Leadership Program. All rights reserved. Website designed by Addicott Web. About to graduate high school? Live, learn, make lifetime friends and explore Israel for an unforgettable year before college. Nativ is a challenging academic year program dedicated to creating and inspiring the Conservative Jewish leaders of tomorrow.